We sell potatoes by weight but you can expect to receive about 24 tubers of this variety in a 2kg bag. A Heritage salad potato bred in 1850. 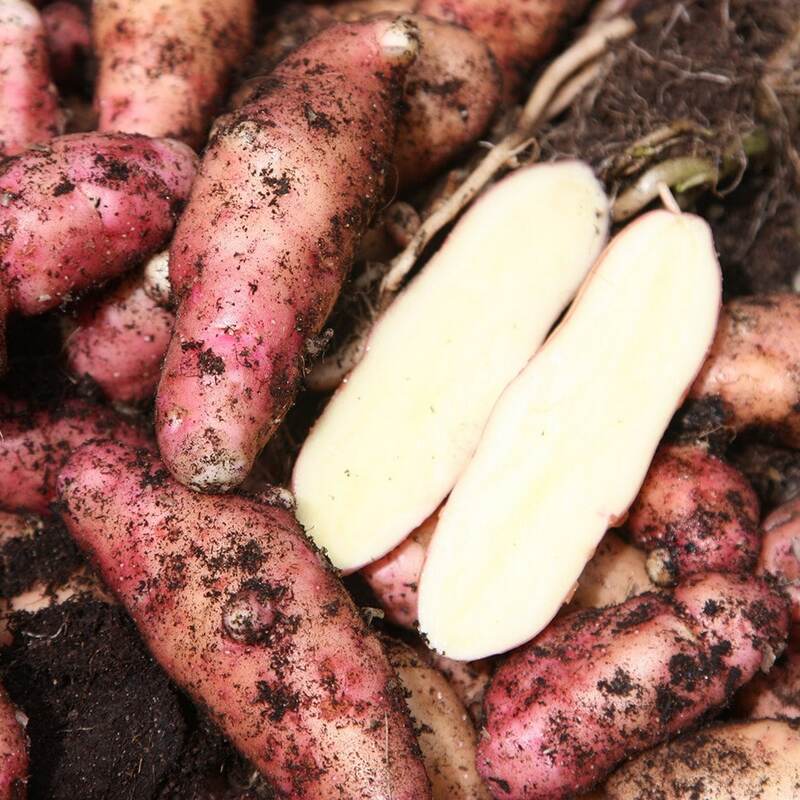 This late maincrop potato has knobbly pink skinned tubers of butter yellow, waxy flesh. An unusual potato that's great as a salad potato but can also be used to make delicious chips - with a single tuber for each chip! It has been given an Award of Garden Merit (AGM) by the Royal Horticultural Society. We grew these in potato bags and they thrived! First time we have grown potatoes and they were very easy in the summer of 2018. Very tasty, waxy potato. Recomend. I grow Pink Fir Apple potatoes every year at my allotment. I received good quality seed potatoes from Crocus which I planted out in March and dug up in September. I store the potatoes in thick paper sacks in my unheated loft and we are just eating the last few now in mid-January. They are really tasty new potatoes which I either boil and eat as is or boil for a few minutes and then roast in vegetable oil and fresh rosemary. I have never peeled/scraped these potatoes so I cannot say what they are like in that respect. Many of my potatoes resemble balloon animals with weird bits sticking out but that just adds to their charm. They don't seem to be bothered by keeled slugs which is a huge bonus. This is the most delicious potatoe with wonderful flavour. Great boiled or steamed and a fabulous salad potatoe. When do I plant potatoes and other veg? When is the best time to plants potatoes? Also can you advise me what veg I could grow now until March with poly tunnels? Am I too late to grow vegetables? I'd love to grow my own potatoes, onions and carrots, which I use a lot in the kitchen, but don't know where to start or if I'm too late. Please can you advise me? Now is the perfect time to start thinking about growing potatoes, as they need to be chitted before planting. Chitting just encourages shoots to grow before you pop them in the soil in early spring. The onion sets can be planted in March or April, while carrot seeds can be sown from late February as long as they are protected.